Working with local copy of my WordPress site I found that I don’t see my uploaded images – I see thumbnails, but don’t see original images. 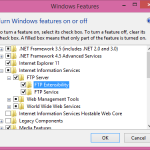 My PC OS is Windows 7 x64, local web server – IIS. When I tried to open image, I got error 500 – in IIS it can be anything. 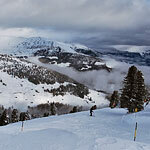 Original images are really uploaded to directory and they are there. But you can’t see them. The reason is in Microsoft style 🙂 Images are uploading from account in "IIS_IUSRS" group. First uploaded file is loading to temp-dir (c:\Windows\Temp) and after that it is moved to destination directory. 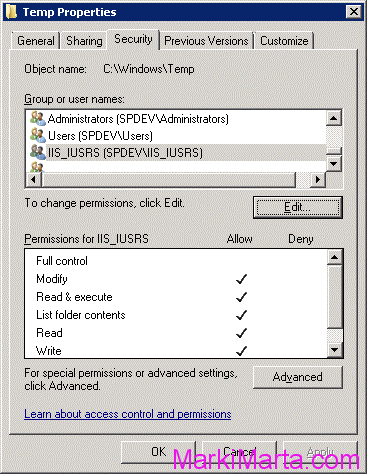 By default "IIS_IUSRS" doesn’t have any permission on "c:\Windows\Temp" and files inside it (Figure 1). That’s why after moving file to destination directory, uploaded image doesn’t have good permissions to. Solution is rather easy – you need to set permissions for IIS_IUSRS on directory "c:\Windows\Temp" and after that original images will be uploaded (Figure 2). It’s not only about images, it’s about uploading any files.